Accurate and detailed design information of oil filled transformers. Detailed models of electrical, mechanical & thermal behavior of transformers. Computer program method is explained for each of the technological areas such as Core area, core cutting schedules, % impedance, short circuit forces, stray & eddy losses, cooling, Impulse calculation between discs, etc. Sample transformer designs are provided at the end of chapters. 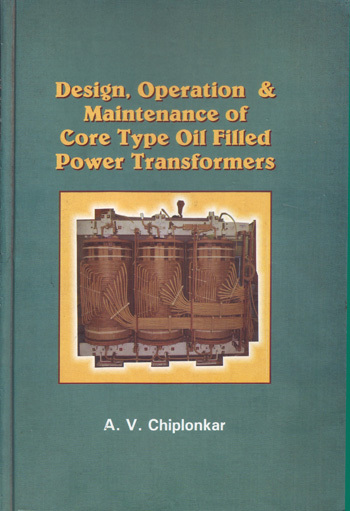 The basic objective of this book is to provide design framework for practicing design engineers to head start the design & analysis of core type oil filled transformers of highest reliability. Advance computational methods used for optimization of transformer design,short force static calculations, stray & eddy loss estimation, insulation design, etc. All the design calculations such as core loss, core weight, impulse , short circuit forces, Stray loss, eddy loss, winding gradients, radiators cooling, tank thickness, etc are based on the designs given in the book. This book is recommended for the following streams. Power Transmission & Distribution Utilities. Large Processing Industries with Substation Educational Institutions & Engineering Colleges. Chapter 1 – Design of Magnetic circuit gives flux density values used in Power, Distribution, Furnace, Generator transformer cores. The calculation of no load loss, no load current, inrush current, hot spot temperature of core & number of oil ducts In the core circle is shown. To select volts per turn a graph of volts per turn against MVA is given. Chapter 2 – Calculation formulae for eddy loss in windings, stray loss in flitch plates, in mild steel core frames, in tank are given in Stray loss in transformers . Reduction Methods for stray loss in tanks by copper/aluminum shunts, yoke shunts for core are Given with typical designs & suitable calculations. Magnetic clearances in transformers for large currents. Chapter 3 – Transformer impedance calculations for various configurations of windings such as HV-LV, Tap-LV-HV, LV-Tap-HV, LV-HV-Tap, double wound & auto transformers With linear, plus/minus, fine/coarse tap arrangement, split windings, earthing transformer, sandwich windings. Chapter 4 – Tertiary winding design with insulation problems, reactor to be inserted in the delta Connections of tertiary windings along with typical fault calculations for enclosed Designs. Protection scheme for the tertiary winding is given at The end of chapter. Chapter 5 – Design of windings & insulation design of transformers gives details of cross over coils, spiral or helical windings, plain discs, interleaved, counter shielded discs Along with conductor coverings for various voltages, inter disc radial block thickness, Etc. Typical insulation arrangements for 33, 66,132,220 KV class double wound & auto transformers are given for information. Typical design data for various ratings such as core, copper, oil mild steel, radiators, approximate weights and dimensions for 11,22,33, 66, 132 KV class with no load loss, load loss, % impedance etc are, also given for quick reference. Chapter 6 – Short circuit forces in transformers are discussed in detail including Calculation formulae for radial & axial forces , compressive force on radial blocks, hoop stress in windings, thickness of Perma wood ring , strength of coil against buckling, plastic failure etc is given. Typical limit values of forces & stresses for transformers for different copper are given. Prestressing of windings is discussed. Computer outputs are compared for line end lead HV, centre line lead HV for various short circuit forces and stresses. Chapter 7 – Impulse calculations for the initial voltage distribution in plain disc windings, interleaved disc windings, partially interleaved windings along with Formula for series, earth capacitance's of windings, inductances & resistances of windings, static end rings at winding extremities are given. Chapter 8 – Special transformers that gives typical designs for Locomotive transformer, Rectifier transformer, Furnace transformer, Earthing transformer, Split windings transformer, High voltage testing transformer, Rectangular foil wound transformer. Chapter 9 – Thermal characteristics of transformers like winding gradients, conductor paper covering Drop, oil velocity effects, average oil rise, winding rises, radiator calculations with or Without separate bank, different cooling methods like ONAN, ONAF, OFAF, OFWF, Over loading & loss of life of transformer are discussed. Chapter 10 – Tap changers used on transformers discusses on load tap changer (OLTC) For star, delta windings of double wound & auto transformers. Typical designs are enclosed for linear, plus/minus, fine/coarse tap arrangements for double wound & auto transformers. Off circuit switches are most commonly used for distribution transformers Up to say 11, 22, 33 KV class units. Typical designs with off circuit links are given in the chapter. Refer Annexure I for the list of typical transformer designs given at the end of chapters 4,5,6,7 & 10. Chapter 11 – Routine, type, special tests on transformers, as per standards are discussed. Typical test certificates of impulse test & short circuit tests carried out on transformers are enclosed for information. List of national & international standards for transformers and accessories is enclosed for reference. 50 Hz to 60 Hz conversion factors are mentioned. Useful formulae for transformer such as efficiency, regulation etc are also, given at the end of chapter. Chapter 12 – Transformer design by computer is discussed in detail along with Optimization of transformer design parameters such as flux density, current density, volts/turn, winding axial, etc is given. Programs for calculation of core net area, core cutting schedules for 1phase- 3 limbs, 3 phase-3 limb, 3phase- 5 limbs are given. Programs for % impedance calculation by vector potential method, short circuit calculation by image method & By Roth-Rabin’s method, Inter disc impulse voltage calculation for plain discs, interleaved, partial interleaved, etc are discussed. Typical Inputs as well as Outputs For most of the above computer programs are given in the chapter with suitable logic used. Chapter 13 – Structural design of transformer tank & accessories shows calculation method for thickness of tank side, bottom, top cover, tank flange, and bell tank along with Stiffener design suitable for full vacuum or desired pressure. Design details for tank curb, bolt pitches, riding lugs, haulage holes, rollers, conservators, radiators, location of OLTC etc are given in this chapter. Chapter 14 – Maintenance of transformers gives inspection program, tests to be conducted & duration . Moisture problems, various methods of drying, drying procedure of the vacuum/heating ovens, oil tests , typical limits for withstand values of oil & moisture, diagnostics & monitoring of transformers, fault detection tools, FRA, PD,Furan analysis, acoustics are discussed in detail in this chapter. Care required to betaken For partial discharges is given. 20/25 MVA, 132/11 KV, star/star, 3 phase ,ONAN/ONAF cooled, ( +5 to -15 % OLTC ), Centre line lead . 20/25 MVA, 100/22 KV, star/star, 3 phase , ONAN/ONAF cooled,( +5 to -15 % OLTC ), Yoke end lead. 25/31.5/50 MVA, 100/22 KV, 3 phase, ONAN/ONAF/OFAF cooled,( +10 to -10% OLTC ) , Centre line lead. 150 MVA, 240/13.8 KV, 3 phase, OFWF cooled,( + 7.5 to 7.5 % Off circuit ) ,Centre line lead. 250 MVA, 240/15.75 KV, star/delta , 3 phase, OFWF cooled,( +7.5 to -7.5 % Off circuit), Centre line lead. 315/315/105 MVA, 400/220/33 KV, star/star/delta, ONAN/ONAF/OFAF cooled, ( + 10 to -10% OLTC ), Centre line lead. 1000 KVA, 11000/433 volts, delta/star, 3 phase, ONAN cooled,( + 5 to -5 % Off circuit), Electrical specification issued to manufacturing shops. 40/50 MVA, 220/22 KV, star/star, 3 phase, ONAN/ONAF cooled, ( +10 to -10 % OLTC), Electrical specification issued to manufacturing shops. 15 MVA, 132/ /3 /66 / /3 / 11 , star/star/delta , 1 phase , ONAN cooled, ( +5 to -5 % Off circuit ) transformer. 3324/1662/1662 KVA, 22000/1196/1196 volts, 3 phase, ONAN cooled,(+10 to -10 % Off circuit ) , Rectifier transformer. 12 MVA, 11000, 185-289 volts , star-delta/ star-delta, 3 phase,OFWF cooled, Furnace transformer. 33 MVA, 27500/150-250 volts, open delta/open delta,3 phase, OFWF cooled,Furnace transformer with Auto transformer. 30 MVA, 33000/ 215 (+&-) 65 volts, delta or star/open delta, 3 phase,OFWF cooled, Furnace transformer with booster transformer. Earthling transformer , 7000 amps for 10 seconds, 33KV Interstar,3 phase, ONAN cooled transformer. 250 KVA, 6600/400 volts, interstar/star, 3 phases, ONAN cooled Earthing transformer with auxiliary winding. 300 KVA, 300/0.4 KV, 1 phase , ONAN cooled , Flash testing transformer. 2000 KVA, 11000/433volts, 3 phase, ONAN cooled, Distribution transformer with rectangular core & Aluminum foil windings. 35 MVA, 33/11 KV , delta/star, 3 phase, OFAF cooled,( +5 to -15 % OLTC ) , Plus/minus type OLTC used. 10/20 MVA, 220/33 KV, star/star, 3 phase, ONAN/ONAF cooled,(+10 to -10 % OLTC ) ,Fine/coarse type OLTC used. 100/125/200 MVA, 220/100/22 KV, 3 phase , ONAN/ONAF/OFAF cooled,Auto transformer with potentiometer type OLTC used . 40/50 MVA, 132/66/6.6 KV, star/star/delta, 3 phase, ONAN/ONAF cooled,( +5 to -15 % taps), Neutral end taps, Fine/course type OLTC used. 20/25 MVA, 132-110/33 KV, star/star,3 phase, ONAN/ONAF cooled,(+10 to -10 % taps), Linear type OLTC with off circuit links to change HV voltages. 10/16 MVA , 110/33-11 KV , delta/star, 3 phase, ONAN/ONAF cooled, ( +5 to -20 % OLTC ) , Plus/Minus type OLTC used. 15 MVA, 11/6.9 KV, delta/delta ,3 phase, ONAN cooled, (+10 to -10 % OLTC ) , Transformer with booster arrangement to reduce current flowing in OLTC .